Handknitted Pottery is run by Hugh Penney in rural County Durham, halfway between the famous cathedral city of Durham and the wild landscape of Weardale. My pottery is intended to be used around the house - I make mugs, bowls, teacups, noodle bowls, teapots, salad bowls, and also make some purely decorative items. Most of my pottery is thrown on a wheel, but I make some handbuilt pottery as well. I mostly work in stoneware but I do make pieces in porcelain, and also earthenware, especially for pieces with decals (ceramic transfers) on. I also offer group classes in handbuilding and one-to-one lessons on throwing on the wheel: contact me for full details and rates. 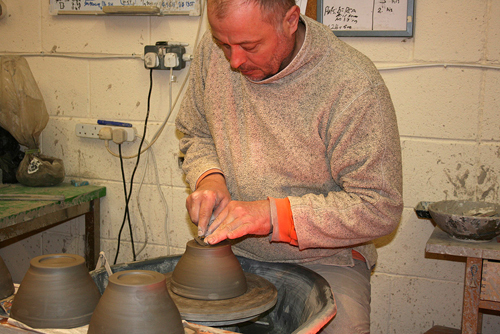 If you enjoy studio pottery have a look inside the site. I am constantly adding to my range so if you can't see what you're after please get in touch. I also undertake commissions at reasonable rates.